George Dent returns with the second book in his kit building series. Locomotive kit building remains the best route to achieving a varied range of motive power in most scales but it also retains a mystique, being associated with expert modellers and expensive tools. However, in this invaluable, richly illustrated volume. 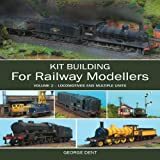 In Kit Building For Railway Modellers Volume 2 Locomotives and Multiple Units, George Dent demonstrates how anyone can successfully assemble working kits with only a modicum of inexpensive equipment and experience. The book is comprehensive, as we have come to expect from George. Over 13 chapters all aspects of assembly are covered in detail including working in plastics, resin and metal; the very basics of working and joining materials; electrics are covered in depth including installing ready-made power units and performing more complex operations, such as assembling etched metal chassis frames and intricate valve gear. Boasting a wealth of practical experience, George Dent has been the in-house model-maker and technical expert at Model Rail magazine since 2004. The author of many articles on various aspects of railway modelling, he also runs model-making courses and produces a range of instructional DVDs. Kit Building for Railway Modellers is his fifth title for Crowood.